Toned chest and arm muscles can improve the way you look, feel and perform activities that require upper body strength and endurance. Perform a comprehensive weight training routine that targets the chest, shoulders, biceps and triceps muscle groups at least two days each week. Start each workout with a five- to 10-minute thermal warm-up that includes some form of cardiovascular activity followed by dynamic and static stretches for your chest and arms. Your chest muscles, called the pectorals, pull your arms and shoulders across the front of your body. Flat barbell or dumbbell bench presses tone and strengthen your whole chest. Dumbbell flys and cable crossovers help define your chest muscles. Use a weight that allows you to complete two to three sets of each exercise for eight to 12 repetitions. These exercises also work your shoulders and arms and should be completed before other exercises. Your shoulders each have a muscle group called the deltoids that allow you to lift and rotate your arms in various positions. Overhead barbell or dumbbell presses should be performed first. Lateral and front dumbbell raises are isolation exercises that shape your shoulders. Upright rows and dumbbell shoulder shrugs can help tone your shoulders and upper back. Perform two to three sets for at least three of these exercises for eight or more repetitions. The muscle on the front of your arm is called the biceps. It enables you to lift and curl your arm. Biceps curls, a standard arm toning exercise, can be performed using a barbell, dumbbell or machine. Try variations of curls using an underhand or hammer grip, when the palms turn inward, in a standing, seated or inclined position. Pick two or three exercises and complete two to three sets for at least eight repetitions. The muscle in the back of your arm, the triceps, works in opposition to the biceps to extend your arm. 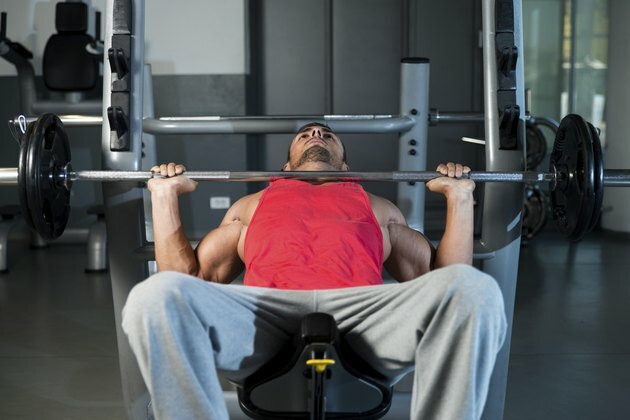 Lying triceps extensions can be performed on a bench with a barbell or dumbbells. One-arm overhead extensions or triceps kickbacks with dumbbells can also firm up the back of your arms. Triceps push-downs or close grip pushups are effective, advanced exercises. Complete any two or three of these exercises for eight or more repetitions. Perform chest and arm weight training exercises on nonconsecutive days to allow muscles time to recuperate. Vary your routine by increasing weight or number of repetitions or trying new exercises. To see improved tone in your chest and arms, you should include cardiovascular activity in your workouts on at least three days each week to body burn excess body fat. Be sure to drink water and eat healthy to fuel your body for exercise.